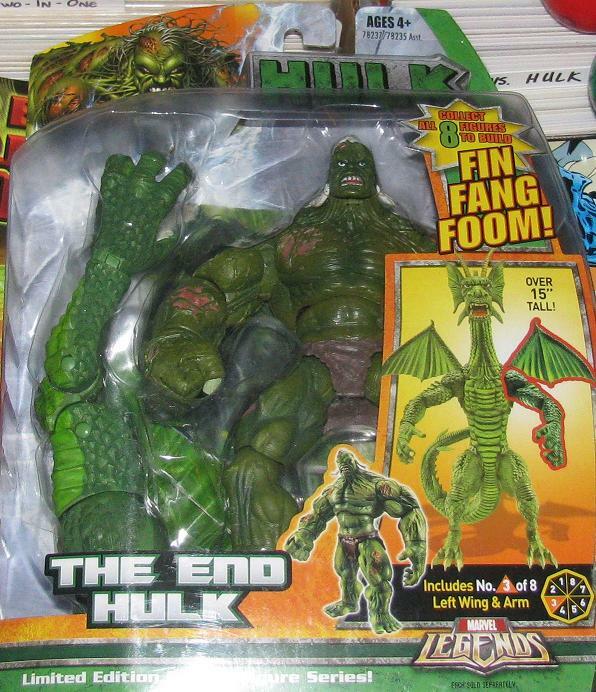 Marvel Legends have had a series of ups and downs in the recent past. With the packaging changed and no inclusion of a collectible comic book and a price hike that’s almost double from when they offered such things I find it amazing that the action figure line is still thriving. Let’s be honest – the entire line has seen some better days – the recent offers of the BAFs are not that exciting. The Odin BAF was very disappointing and the Ultron BAF was underwhelming as well. The Groot BAF was surprisingly awesome – even if most of the figures featured in the series was not very desirable. I didn’t even bother with the Iron Monger or Mandroid. They aren’t terrible but they weren’t all that impressive either. Should I even bother getting into the Hobgoblin (that should never had been a BAF in the first place)? The most recent series, though, have made most of my collector friend’s ears perk up. 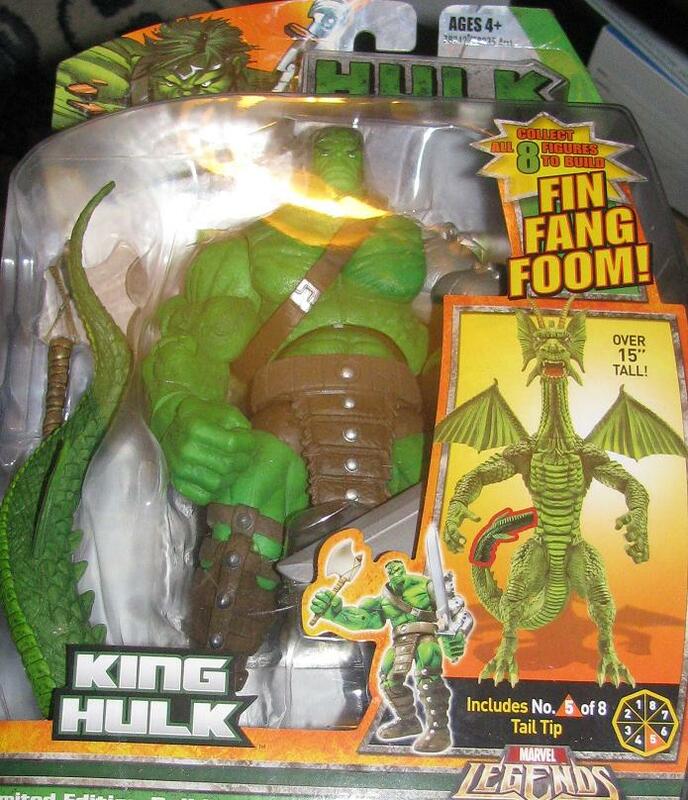 It started with the Rhino that came with the Spider-Man series – a BAF that rivaled the previous “best figure” from Marvel Select. The Rhino even came with a change-o-head – a modern and a classic (I’m so partial toward the classic I don’t even bother with the modern) and while it’s far from a useful accessory it’s still nice to see Marvel offer choices. The Hulkbuster Iron Man series was the first Marvel Legends line that I actively sought out in a long time! The promise of a substantial and humongous Hulkbuster figure proved too much for me to stay away. Most of the figures weren’t appealing – although they were very nice – I was only interested in Thundra, Valkrie and the good Doctor. I had to barter, promise and even threaten (not really but it sounds good) to acquire the rest of the pieces to complete this huge behemoth! It’s a fantastic figure – certainly worth picking up if you can get a good price but this one gets pretty pricey! There are some minor tweaks I would have loved to make – especially the flat red paint – but it’s not enough to make this figure any less desirable. 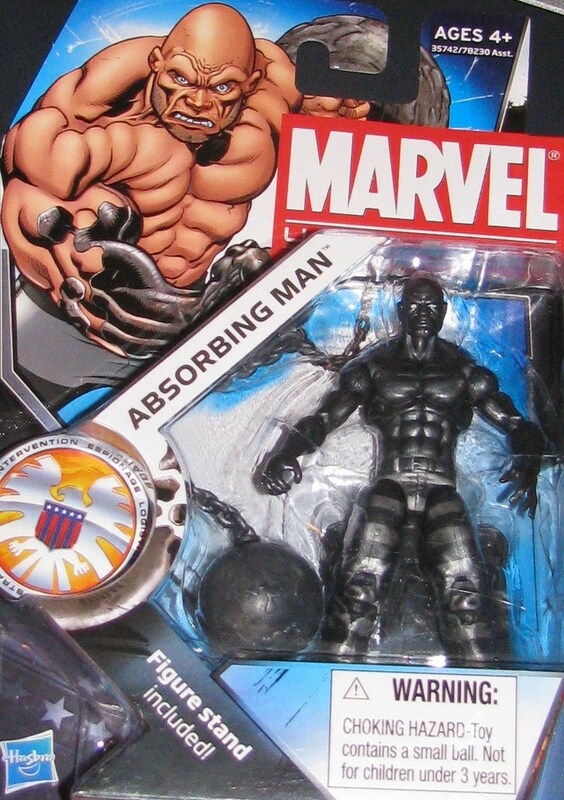 Now, onto the newest BAF, the Absorbing Man! This is the latest Spider-Man ML series to line the pegs and it features some fantastic figures – never mind one of the better Absorbing Man figures ever made! 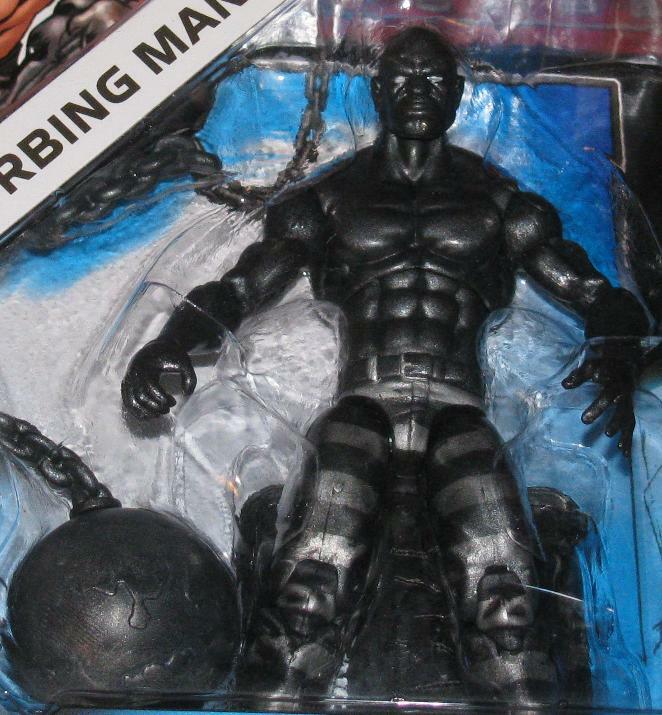 As it compares to the figures before it – let’s visit it one by one – The Absorbing Man from the Hulk Transformations line is a great figure – where the BAF trumps it is in size – and size only – because the sculpt, paint and accessory (the size of the wrecking ball he comes with) is all pretty great. 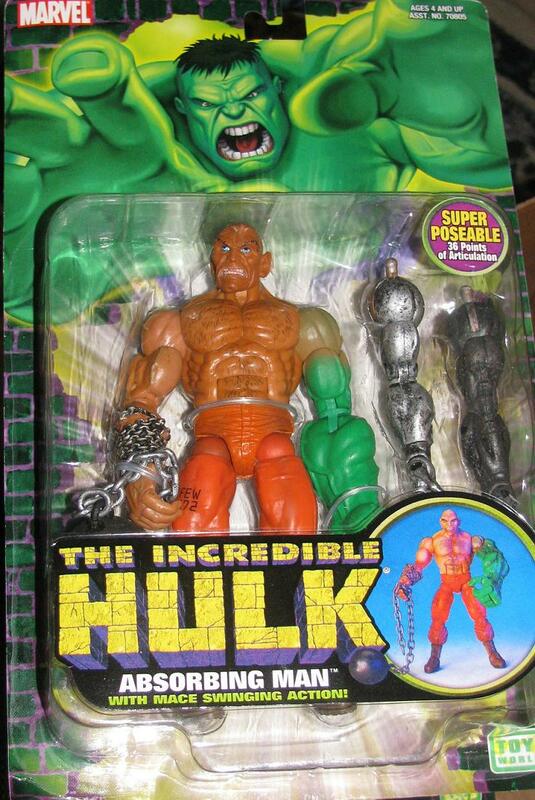 The Hulk Classics Absorbing Man figure is very rare, very cool and extremely expensive on the secondary market. It’s also one of the cooler figures ever made of the guy! All except the size it might’ve taken the top spot. 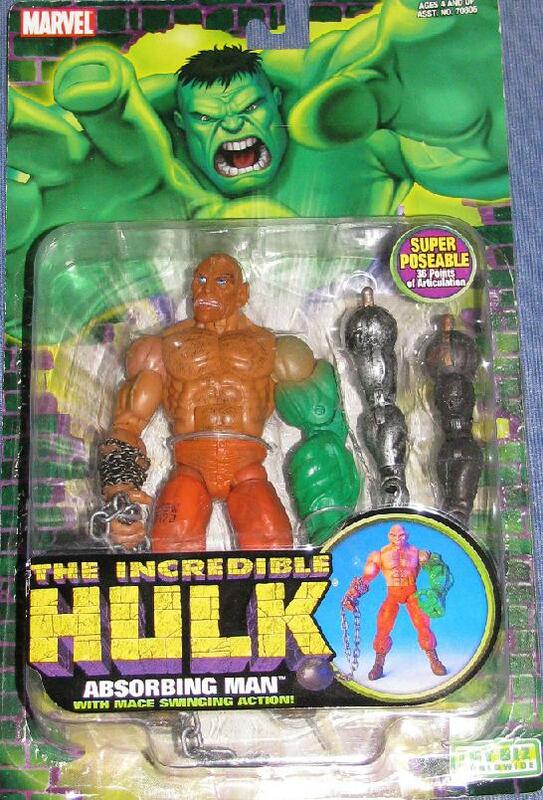 The scale really doesn’t knock it off the top of the list though – but another figure like this on card or in package and the Hulk Classics Absorbing Man might be knocked off the peak. 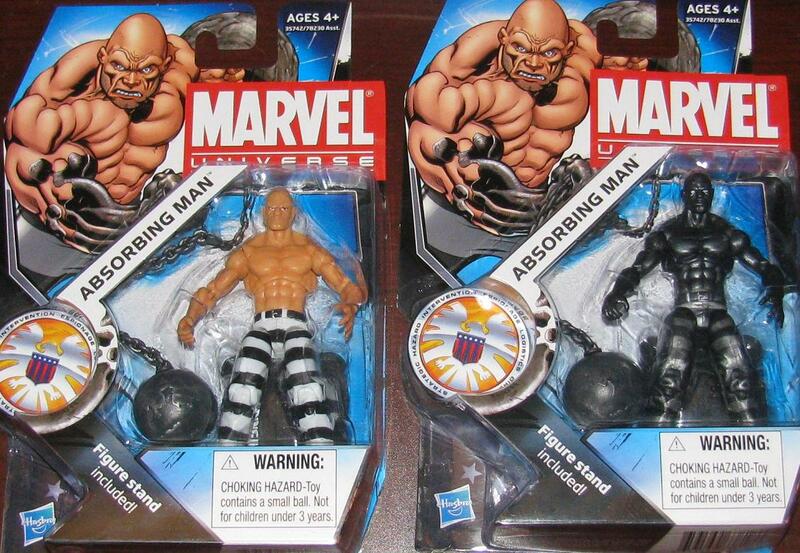 The Marvel Legends Absorbing Man from the Hulk line is a decent figure – all but the made model head they chose. He just looks too handsome! Can you imagine this villain getting into a fight and screaming “Not the face – hit me anywhere but the face!” Not to mention the size of the ball and chain is on the small side. 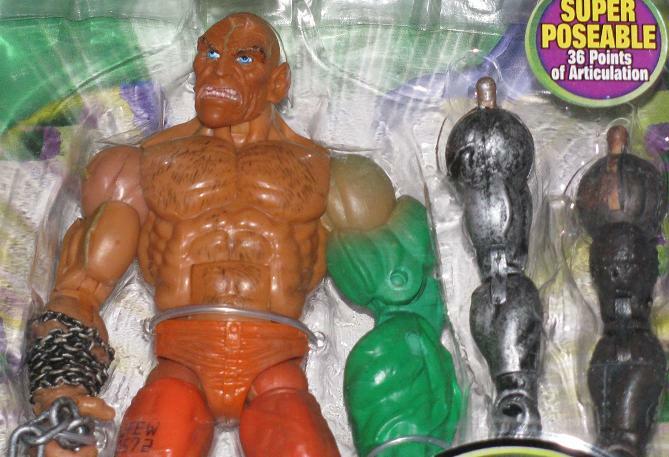 The Absorbing Man also comes with a change-o-head – one without a transforming look – and it is great but I am sticking with this one… unless I can find another body without paying a premium. It also has an extra arm (normal) and another (transforming into wood). Totally worth the pick up if you have the chance! The only thing I’d change is ball and chain to have a loose chain rather than a sculpted, solid chain. 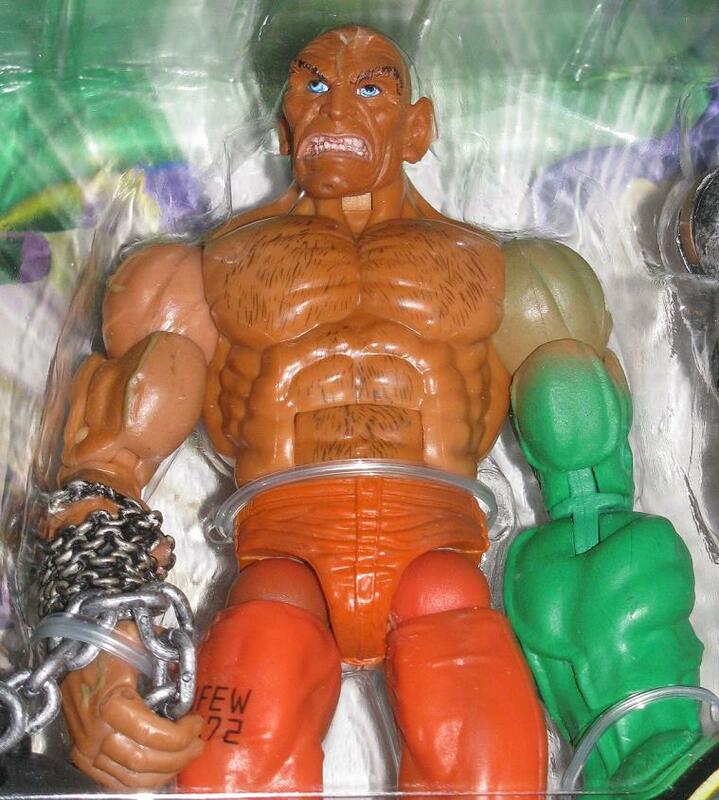 Another quick look at the bounty that had befallen me this past weekend – Mike made me aware that there were actually two versions of the Absorbing Man figure from the Hulk Classics line. 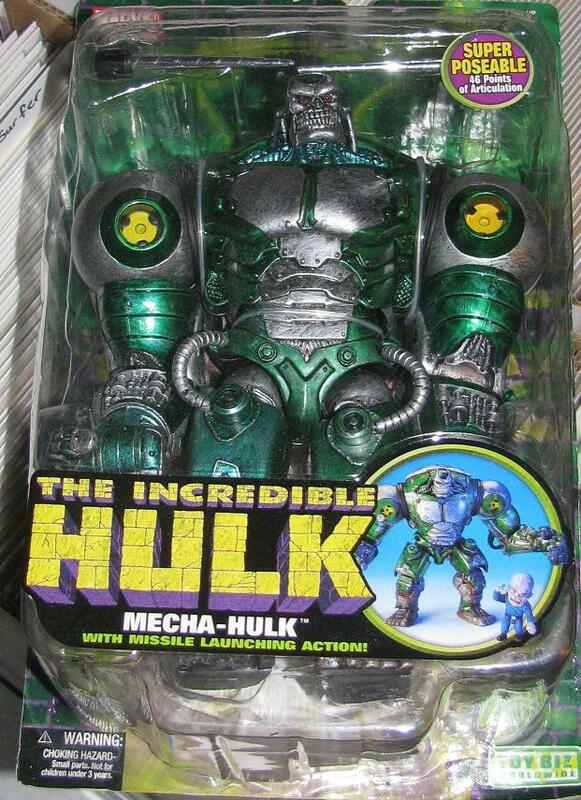 I wasn’t aware of this before – the US version had a bulky Hulk arm while the European version her a skinny Hulk arm. 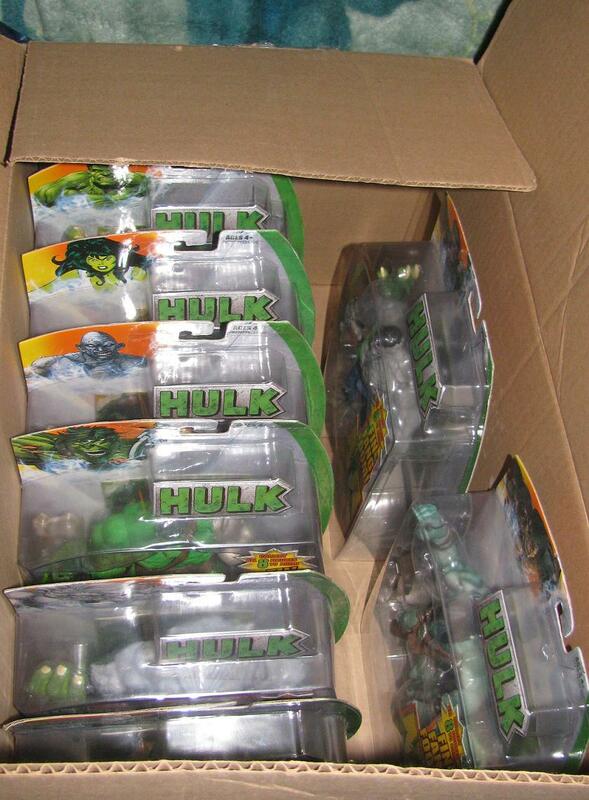 Both versions are pretty similar – except for the Hulk arm and the top of the package where the peg holder is. The L shaped US version is drastically different from the oval with a bubble style that the European version has – but either way it seems the US version is a little rare and a little more sought after. 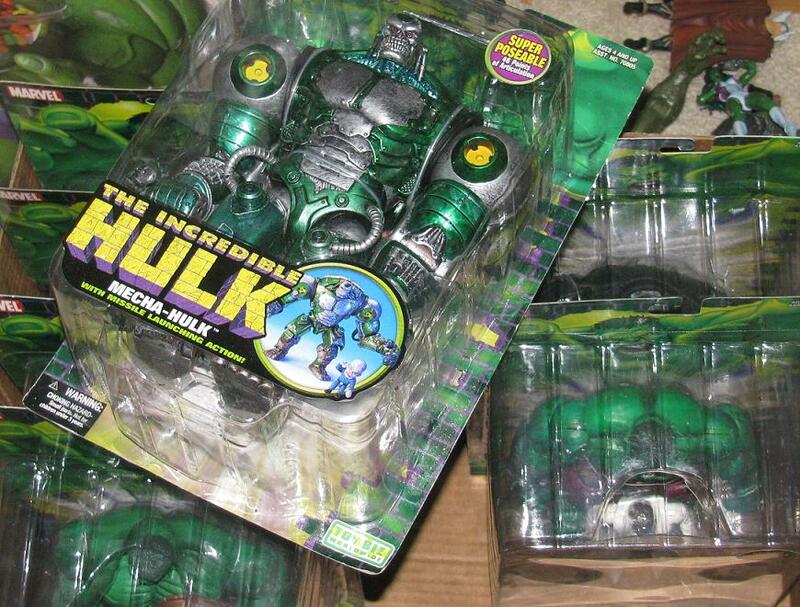 It makes more sense, to me, that the Hulk arm would be bulky rather than skinny so in essence it makes total sense that the large arm variant is more coveted. 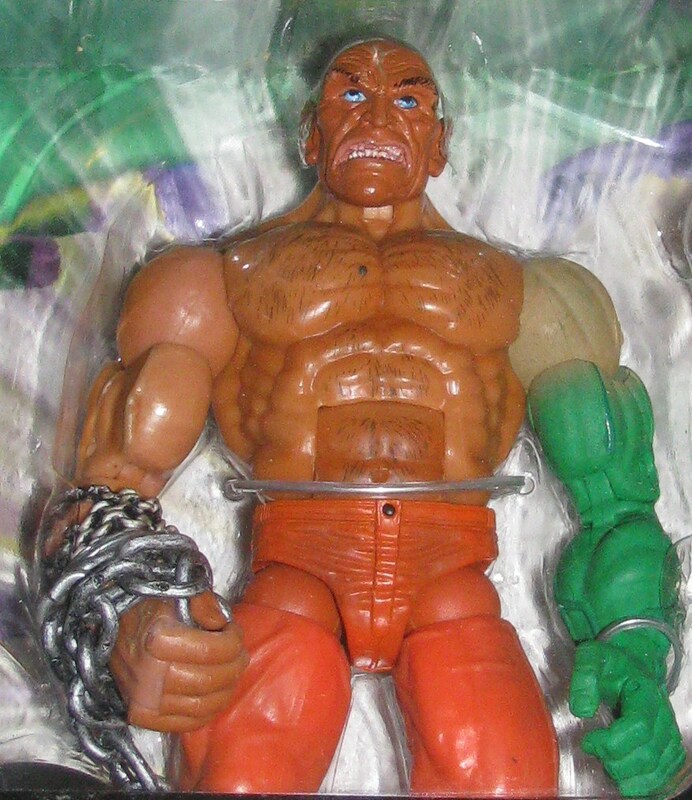 Of all the Absorbing Man figures released this one doesn’t have the bulk that the ’96 version has – but I do prefer this one to the Marvel Legends version. He sort of has a Vulture vibe to him but I think that works in his favor. It’s truly a fantastic and creepy looking figure. If you haven’t been able to track one down yet even having an open version of this guy is worth it! 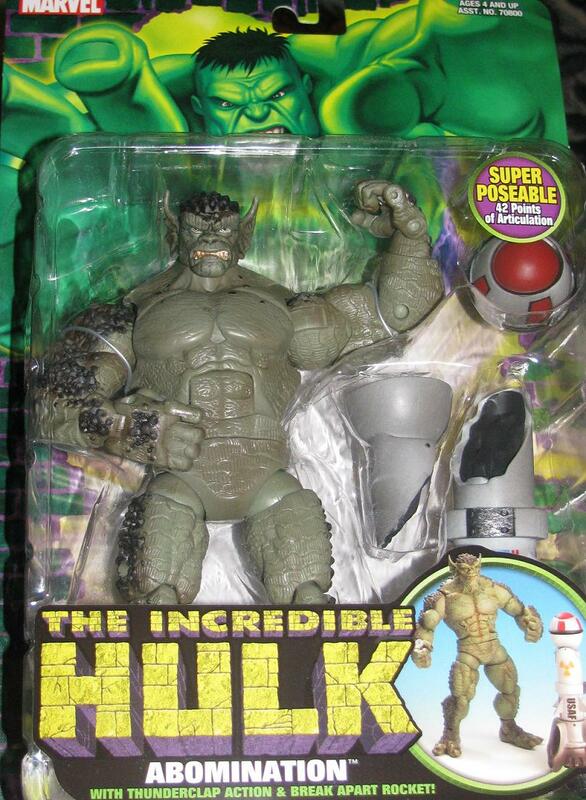 I love these figures – and still think this Hulk line tops any other. 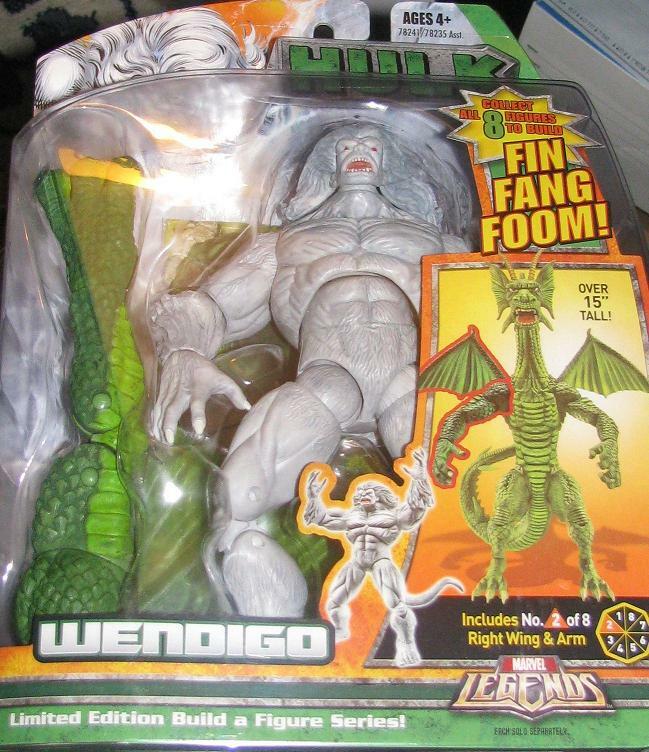 I finally scored one – this surprised me – how hard it was to track this figure down. I was able to get the variant at my LCS and it is a good thing I did because I never even saw the variant on the shelves of Target and TRU in my town. But true to form after I found the regular at another LCS, and paid a premium, not even two days later I saw these figures at my local TRU. That’s okay, I was more than happy just to finally bring this figure home. 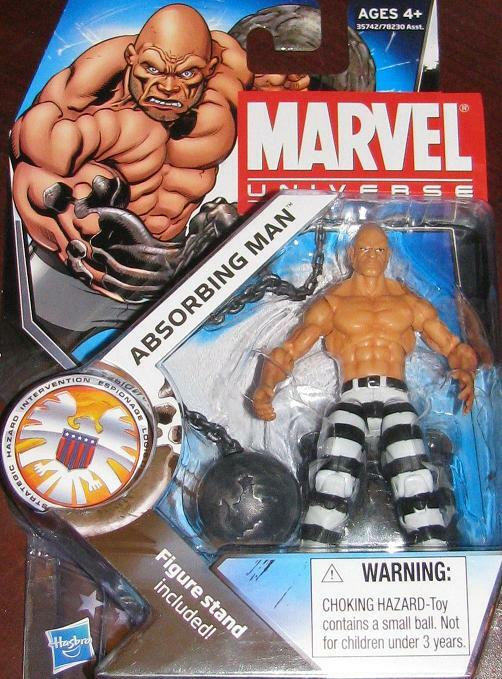 I am even more excited because we now have the whole transformation of the Absorbing Man – we had the half transformation Absorbing Man that came in the 2-pack with Dr. Doom before. Now all that there is left to do is to try to track down multiples so I can open them up! 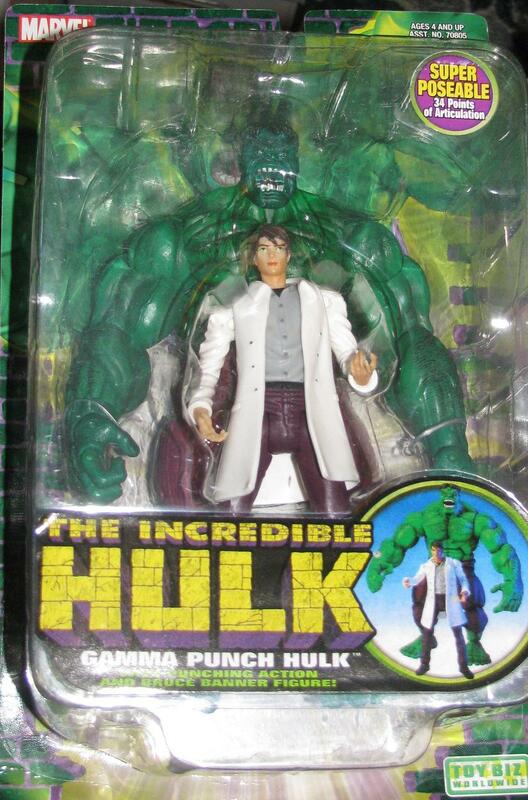 This is one of the most sought after figures from any Hulk line… ever! 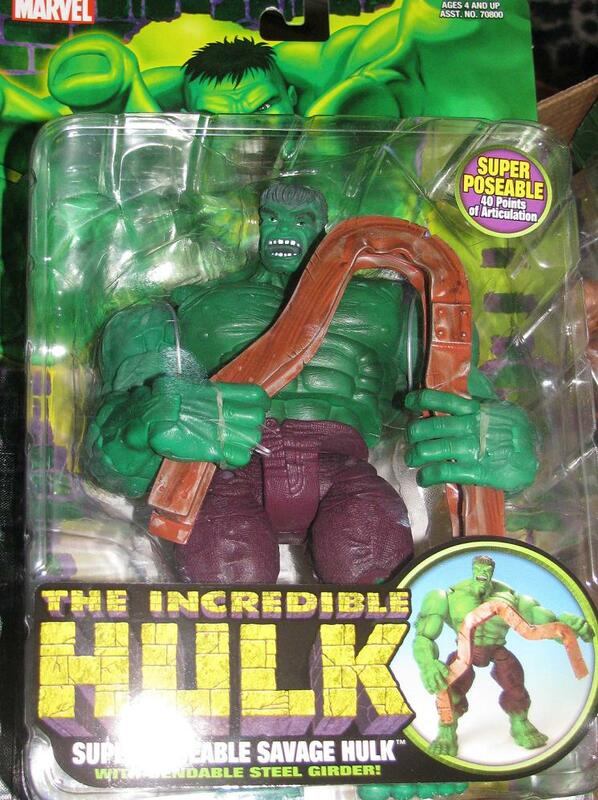 It’s not even a Hulk figure – and even more-so – it’s the Absorbing Man! Who is actually, for all intents and purposes, a Thor villain. 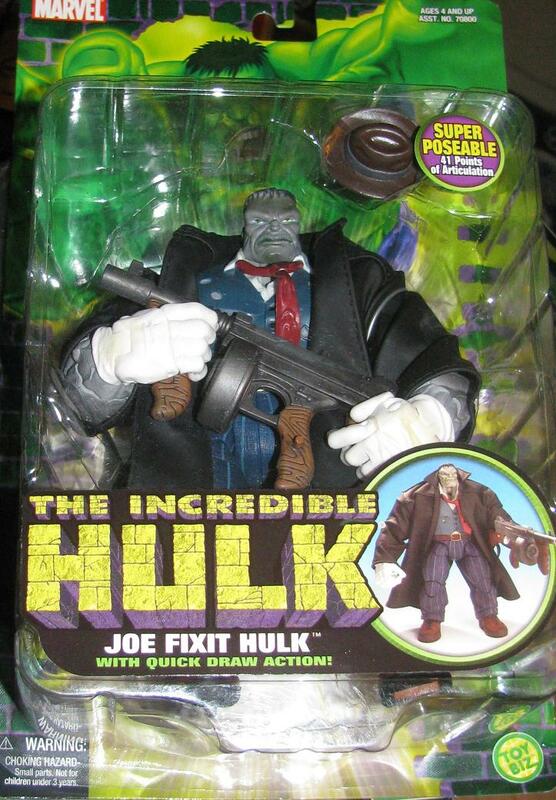 But – this figure is WAY better than any Absorbing Man before OR after – and one of the best parts – the thing that puts it over the top, the thing that no one has even tried to do again (but SHOULD) is the interchangeable arms. One is steel, one looks like iron – but the third is the ultimate – a Hulk arm! Although – that hasn’t happened in the comics. 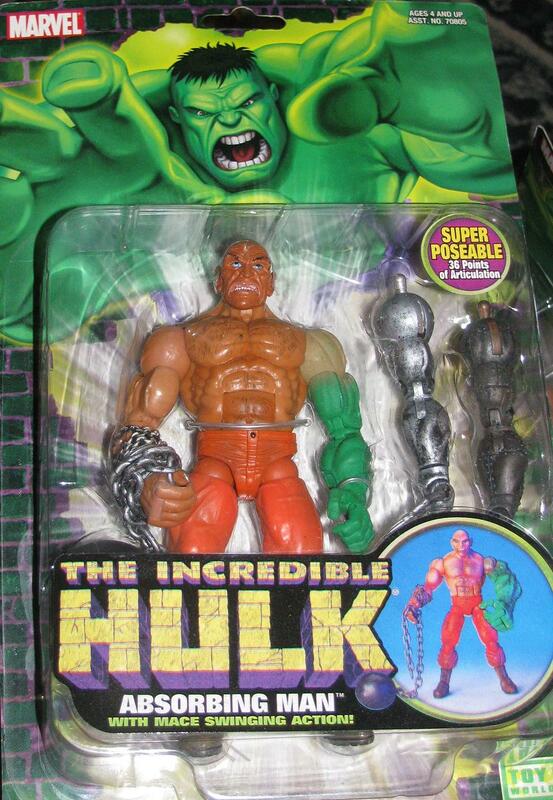 I am not 100% sure – but I think the Absorbing Man can only take on properties of inanimate substances. You can’t see this in the photos – but this figure (which easily sells for a hundred +) that I found in a LCS – just sitting on the shelf! This figure is actually complete – but off the card. I put it together with some glue and tape and it looks fantastic! Just like it was before someone haphazardly took it out of the package! I’m not sure if I asked this before – is anyone out there who collects keep the figures in the package like I do? I know a few collectors out there, like JG and Sean, they take these little plastic treasures out of the blister cards – but I love them the way they look inside the package! By the way, has anyone seen Toy Story 3 yet? Freakin’ movie is fantastic!